The most recurring forms of acne happen on the back, face and chest. Although scalp acne may not be the most common form of acne that people have to deal with, it does not diminish the annoyance of those who have to face on a daily basis. If you are one of the unlucky ones who suffer from this condition, you are probably desperately seeking a quick and easy solution. The unfortunate few that do suffer from this condition state that it is by far the most troublesome form of skin inflammation. The main cause for acne on the scalp is that cells and oil get stuck in the hair follicles. If you are one of the unlucky few that do deal with this affliction then you have come to the right place. We thus present you with a guide to the steps that you are able to take in order to lessen or cure yourself of this nuisance. First and foremost you should get an adequate idea of the type of acne you are dealing with. We will first thus isolate its causes. We will then underline the possible symptoms you may be experiencing, so you can be sure that this is the problem you are facing. Once this has been clarified, we will move onto several tips that will effectively aid you in treating this form of acne. What Is Causing Your Scalp Acne? As it often happens, researchers have not reached a unanimous conclusion on what exactly causes scalp pimples. There are several different explanations as to what results in its formation. In the information below we will analyze the most popular causes and hopefully extrapolate a relative origin of the condition. It is quite likely that the dermal formations you may be experiencing result from one of the following causes. The primary cause of your acne is most probably a change in your system’s hormones. It is no secret that teenagers experience their hormonal levels increasing and plummeting quite spontaneously. Although this affliction is short-lived for most individuals, acne also arises during a woman’s menstrual cycle and is thus also affected by changes in hormone levels in such situations. Although there are many different factors that may attribute to your scalp acne, the reason may simply be hereditary, as well. Simply put, if skin problems are prevalent in among your relatives, you might also have to deal with similar complications. Your acne problems may also simply be due to the shampoos, hair masks or conditioners you’re using. Therefore, a sudden change in the appearance of your scalp may be due to such products. The best option is to try to switch to a different brand. Certain people are more intensely affected by the meteorological conditions around them, They may thus be more susceptible to acne formation due to humidity and increased temperatures. A possibly unavoidable, yet very relevant cause of acne is exposure to pollutants in the air. This is especially troublesome for individuals living in metropolitan areas. In the following text we will go over the reoccurring symptoms of scalp acne. You may experience some or all of them, depending on the severity of your condition. Most people with scalp acne will only deal with a couple of areas that require attention. Indeed, if you are dealing with scalp acne it is best to take measures in order to avoid further symptoms in different areas. The main area affected by scalp acne tends to be that of the forehead, and specifically, directly below the beginning of your hairline. Most people will thus not experience scalp acne on the center of their scalp. The good news is that if you are experiencing acne in the location of your forehead, it means that your breakout will most likely be short-lived. Still, make sure to treat this symptom as soon as you discover it. If you do not take the necessary measures in remedying it, it may result in folliculitis. Folliculitis takes place when your hair follicles are exposed to acne, resulting in its possible spread further throughout your scalp. One of the first signs of this symptom of scalp acne will be visible flakes appearing throughout your hair. At first glance this may look like dandruff but in reality it is not. Most individuals will instinctively resort to beauty products for combating dandruff but in most cases this will not resolve the problem. Instead, if you make the connection between these flakes and acne on time, look for products that concretely combat this symptom in regards to scalp acne. Where Did These Pimples Come From? Some people will experience acutal sightings of red pimples from the beginning. These tend to show up very close to the center of their scalp, have light heads, and sometimes contain pus. It is not uncommon for these pimples to even sporadically begin to seep their discharge. The cause of these pimples largely depends on the type of acne you have. You can hypothesize about this based on the particular signs of scalp acne you are dealing with, as well as based on how severe your condition is. One thing that is certain is that if you leave this condition untreated it will most likely worsen, resulting in a even more complex and extreme scalp acne. Scalp acne can even result in hair loss. 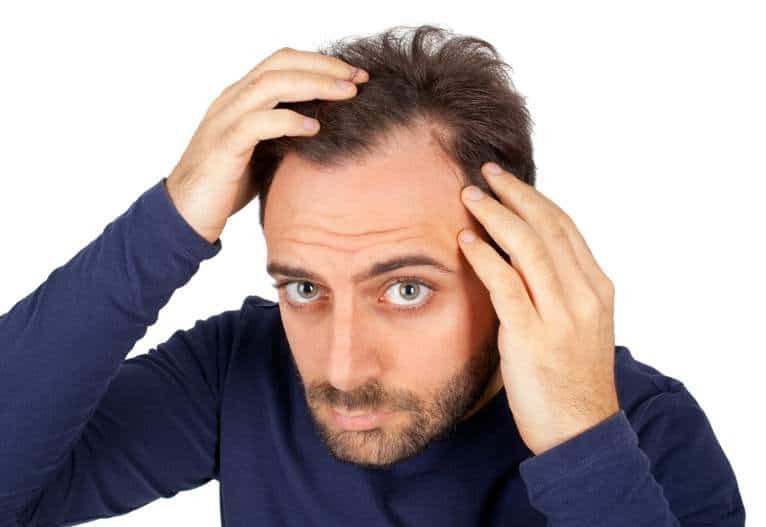 Something many people do not know is that if you neglect scalp acne, it may actually result in hair loss or bald patches on your scalp. Don’t worry too much, as this tends to be a rare occurrence. Still, it is best to take preventative measures rather than deal with the complications later on. The listed symptoms are more extreme forms of acne. Nevertheless, it is quite common to still experience more normal symptoms of acne, as well. Examples of such symptoms are a hyperpigmentation of your head or a distinct redness around the scalp area. In addition to this, a general inflammation of the scalp is not uncommon, which will typically be accompanied by an uncomfortable itching sensation. How Can You Combat Scalp Acne? Because of the particular unpleasantness of scalp acne, you may feel like it is the end of the world and there is no cure for you. Worry not, as you would be wrong about that. So, what solutions are available for your condition? This step is an easy one. Make sure to clean your hair thoroughly, as often as possible. Do so after each visit to the gym, as well as every time you feel yourself sweating excessively. This is the single and most potent cure to scalp acne, which is typically a germ-related condition. Bacteria tends to clog your pores, leading to an excessive availability of oil in your skin. You may be trying to use fancy and specialized shampoos, but this may not be the best approach. Instead, opt for a natural, mild shampoo which will be gentle with your scalp. You should thus also avoid conditioners. Although they are advertised as helpful, they often only serve to add chemicals to your hair. In fact, many respondents claim that their scalp acne disappeared less than a week after they took the conditioner out of their hair routine. If all else is failing thus far, give this a try. Tea tree oil is an excellent remedy for all kinds of skin conditions and acne, including scalp breakouts. Just drop a little bit of the oil into your shampoo and treat your hair with it. There are also shampoos with tea tree oil, which you might find at your local health store. Salicylic acid may be the best known treatment for acne. This acid serves to do away with various kinds of bacteria and dirt which may be stuck on your skin. As it is germs that cause acne, salicylic acid is our most efficient cure for pimples. Opt for a shampoo with this ingredient, or any sort of hair mask that contains it.